The New York Riveters made quite the splash on the first day of unrestricted free agency (May 1) when they signed an All-Star on defense in Kaleigh Fratkin and an All-Star goalie in Jaimie Leonoff, both who played for Connecticut last season. And then for good measure they signed a future All-Star (bank it, trust me); more on her later. With the worst record among the four teams in the NWHL, everyone assumed their would be changes with the Riveters, but these additions (only on day one) may have left the league and it’s fans saying: OH SNAP! Fratkin brings an element on the blueline that the Rivs lacked last year — a point producer who can quarterback a power play and is also responsible defensively. She signed with New York on day one, and confirmed to The Hockey Writers that the Riveters were atop her wishlist of teams she wanted to skate for in the 2016-17 season. As any good student of the game does, Fratkin did her homework on where she would eventually be heading. 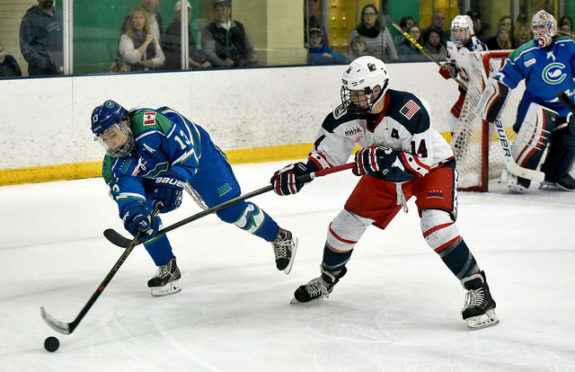 One of her college teammates, Taylor Holze, was with New York from the start of the season, and one of her roommates, Chelsea Laden, was traded to the Rivs from the Whale last season. So any questions she had about the organization were certainly easy to find out, and easy for Leonoff to have access to also. But the question remained, did she also know that Amanda Kessel would also be signing with the Riveters and did that influence her decision at all? A player of Kessel’s status and skill level would certainly be a good selling point in attracting other players to join a particular team. The move you planned in your head for a while becomes real deal when you change your Twitter bio though! Finally, Fratkin also had a message for the fans of the Connecticut Whale that she is leaving behind and the fans of the Riveters that she will be playing for.